What was your biggest takeaway from the teaching? How have you traditionally viewed Sabbath? Is it something that’s been part of your life at any point? If Sabbath hasn’t been part of your life, what will hold you back from engaging it? Does the way you conduct your work convey that you trust yourself, or God? Why? “Unless we trust God’s sovereignty, we won’t dare risk Sabbath.” Do you believe this is true? Are you experiencing the ability to relax, or the pull to worry in your life when it comes to your work? What is one thing you will do this week to trust God anew in what He’s asking you to do? Brad, thank you for this teaching. In my life, a day of rest is something I grew up with and still keep the Lords day as a day of rest. As you know, Christianity has taken some intentional steps to get away from Judaism, with Sabbath being one of them. Keeping the day of rest Sundays vs Saturdays. How does one hold the tension, living in a community where Sundays are the day of rest instead of Saturday, in how God commanded it to be? God specifically blessed the Sabbath day and made it holy, and yet Christianity in large part doesn’t hold that day of rest. How does one hold that tension? Is it more important to have a day of rest rather than on a specific day? (Sabbath) Also, the tension of it not just being a religious act, but it being a day of true rest. What are your thoughts on the significance of the day of rest being on the Sabbath vs the Lords day? I go in greater detail about this in the seventh episode in this series. I believe it’s more important to take “a day” rather than specifying “which day.” Again, I do go in greater detail. Once you’ve engaged that teaching, let me know if you still have a question you’d like to me to address to go further into the questions you’ve asked. Thanks, Emanuel. Thank you for this teaching, a great reminder of some of what I learned while in Israel with you last March. This has been one of the greatest blessings of that trip, as I have seen God truly take care of the details of my schoolwork when I choose to trust Him and take a Sabbath. May He be praised for His sovereignty, and may you be blessed for sharing Truth from His Word and the context of your own life choices. So thrilled to hear, Ron! Trust in the Lord with all your heart and lean not on your own understanding. In all your ways acknowledge Him and He will set your paths straight. Thanks for sharing all of this, Chris. I hope you’re able to find some Sabbath days in the month as well. In the seven episode in this series, I talk about how we make it work. Perhaps that will be helpful to you. Stay tuned. Brad, I really appreciate this teaching on Sabbath. My question is what do you do if you’re in a bi-vocational ministry situation that requires working 7 days a week? (5 days to pay the bills, 2 for the calling you believe God has placed before you) I understand the need for rest, but what if there seems to be no other option at the current time? Hi David, I address this in the seventh installment of this series. So hang with me for a few more and we’ll get to this. Thanks! I love the teaching you provide. One of the challenges wrt the sabbath is where Jesus says in John 5:17 that His Father is always at work and Jesus is also always at work. The context is relating healing on the sabbath versus doing work. Haha! I was just waiting for that passage to get brought up 🙂 Thank you for doing so, Dwight. I’ll be addressing that in the final episode of this Sabbath series. The Law, referred to in the New Testament as the “ministry of death, written in stone”, given only to Israel, is fulfilled at the cross. Yes, the 10 commandments may not be abrogated by the “ministry of the Spirit” but there are many other ways God uses to teach us to trust Him. Pain is, unfortunately, a great teacher of that esp in our broken, chaotic world. This teaching is a good suggestion, if possible to implement in your life and/or you’re lead by the Holy Spirit, but it is not a mandate. Romans 14:5-6. Appreciate your comments here, Stephen. I’m going to address this in the final episode of the series. I never had thought before of the fourth commandment, keeping the sabbath, as a connector between the first three, which tells us how to relate to God, and the last 6, which tell us how to relate to each other. Thank you for the new insight! You are most welcome, Jim! • In scripture, is the practice and principle of Sabbath extrapolate-able? Should we cease & rest every seventh month? Every seventh year? etc. • Relatedly, is there teaching in Scripture about ‘extended’ Sabbaths? (Doing what we would call a ‘vacation.’) More generally, is the practice of taking extended vacations (where we cease work and seek to rest) somehow rooted in the principle of Sabbath? Enter your email to receive the weekly Teaching Series (and other news) and receive this FREE eBook now! Absolutely NO SPAM! Unsubscribe at any time. and we’ll email you the weekly Teaching Series so you’ll never miss a teaching. 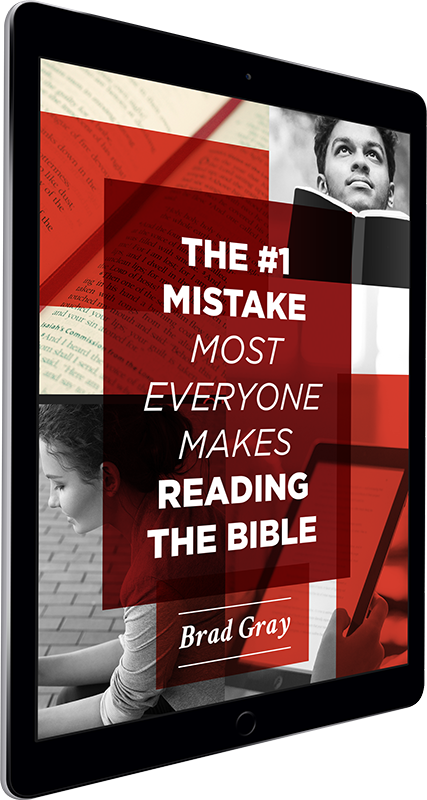 You’ll also receive this eBook, “The #1 Mistake Most Everyone Makes Reading the Bible” which will launch your journey for reading the Bible in context.